Roots are important. They help you know where you came from. They give you a sense of identity, heritage, and history. The people of Israel had a deep sense of history and they knew their roots. They learned from their ancestors in ways that we have largely lost. They saw themselves as part of something bigger and more important than themselves--something God was doing in history. In our individualistic, narcissistic, ahistorical culture, roots are something we are lacking and we desperately need. Narcissism breeds isolation, and for the most part we've become islands unto ourselves. We've lost our sense of legacy. I wish I knew more about my family's history--where we came from, how we navigated through hard times, how we celebrated good times, and how God worked through my family to do great things in history. While my understanding of my roots might be small, I do know some things about my roots, and I'm working on learning more. One person who inspires me is my grandfather, who is now with the Lord in glory, David King. Below is a little bit about his story. My grandfather on my father's side was named David Albert King. Before the United States entered World War II, when we were isolationists for the most-part, my grandfather had the foresight to see that Hitler was an evil man who needed to be stopped. He decided therefore to enter the merchant marines. The merchant marines were one of the few groups of Americans who helped the British in the war efforts in those early days before the U.S. officially entered the war. They would send loads and loads of supplies across the Atlantic to keep the British supplied with medicine, ammunition, food, and whatever else was needed. 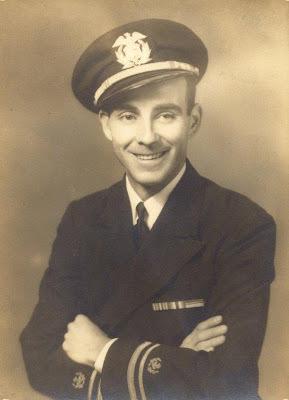 After joining the merchant marines, he was given the position of navigator. Back then, that didn't include radar or GPS. He would guide ships across the Atlantic simply by using the stars, a compass, some maps, and his knowledge of tides. He continued doing this after the United States had entered the war post-Pearl Harbor. On one occasion, England was in dire need of supplies, and my grandfather's vessel was at the head of a massive supply convoy. The other ships were following his ship, so he was acting as the navigator for the entire convoy. As the convoy approached the British coast, a thick fog set in. This fog was so thick, my grandfather later recalled that he couldn't see his hand in front of his face, two feet away. The convoy slowed down to a crawl to avoid crashing into the rocky coast. The ships constantly sounded their fog horns to avoid hitting each other. This thick fog persisted for days. Finally, it was decided that Britain could wait no longer. People were dying because they needed the supplies in those ships. But many more could die if the ships ran aground or sank. It's hard to appreciate the difficulty this situation presented. When one is on the open sea, they are largely blind to their location and movement because there are no fixed points of reference--except the stars. Take them away, add days of drift in a blinding fog, and an entire convoy of vessels, some of which are filled with sensitive munitions and gunpower and you have a sense of the magnitude of this task. Nonetheless, like someone threading a needle with their eyes shut, my grandfather carefully and skillfully navigated the entire convoy safely into the harbor--even though he hadn't seen the stars in days. He relied solely on the heading he had marked out days earlier and his compass. This was a great and heroic feat--one so great that after he arrived, Winston Churchhill himself sent for my grandfather and personally gave him a medal. When my grandfather returned to the United States, he entered New York harbor, and as his ship entered the harbor, he could hear the harbor patrol calling his name. He wasn't sure what to make of this, but when he got to the harbor patrol, they loaded him into a black car, and drove him from New York to Washington D.C. To his amazement, the driver pulled right up to the White House, and he was escorted out of the car and into the oval office. By this time it was night. Franklin D. Roosevelt was in his pajamas, and there, in the oval office, my grandfather met President Roosevelt in his pajamas. To thank my grandfather for heroically navigating the convoy into the harbor, President Roosevelt gave my grandfather a license to navigate any ship of any tonnage on any ocean. Later, my grandfather speculated that Roosevelt didn't want to be 1-uped by Churchhill--especially when it came to honoring a U.S. soldier. Later in the war, my grandfather was navigating a vessel in the Pacific theater. He had known for some time that God had called him to be a pastor, but he was resisting God in this. One time during a horrible battle, there were ships sinking around him, and he looked up to see a Kamikaze headed straight towards his ship. At that moment, he fell to his knees and told God "Yes!" "Yes, I will serve you however you want me to." "Yes, I will follow you despite my trepidation." "Yes!" He told God that if he got out of this mess, he'd spend the rest of his life devoted to preaching the gospel. As he prayed this prayer, the crew was calling out "Kamikaze!" to one another, and the two machine gunners on either end of the ship started shooting in a panic as they searched for the rogue plane. Their shots came no where near to the plane, but nonetheless the pilot seemed to be startled by the gunfire, and pulled up slightly on the stick, just enough to miss the ship and crash into the water. After the war, my grandfather married my grandmother, Flora Mae King, and he faithfully served God as the pastor of the First Baptist Church of Bell for over 40 years. He shepherded a small flock that was entrusted to his care with diligence and faithfulness. He watched as the church grew, and eventually dwindled as his town transitioned from a predominantly Caucasian community to a predominantly Hispanic community. As this transition took place, my grandfather had the foresight to begin mentoring a Mexican pastor, who eventually took over the church. Today, his church is thriving, teaching God's Word, and spreading the gospel. Through the ups and downs, my grandfather was faithful and he made the kingdom of God his priority. He sought God's kingdom and righteousness above his own, and as a result, he lived a powerful life. There's a few things I can learn about my heritage from my grandfather. I can learn something about the character of King men. King men are men who exercise great foresight, they are men who do what's necessary to stop evil and injustice, they are men who step up to the plate when there's a need, they are stubborn men--who sometimes resist to God's call on their lives, and they are men who eventually submit to God's call and serve Him with faithful endurance. That's a little bit of my roots, and I'm better for knowing it. Winter 2018 issue of Philosophia Christi: Pascal's "Abductive Anthropological Argument"
What’s the Deal with Apostles & the Five-Fold Ministry? Nathanael V. King. Theme images by 4x6. Powered by Blogger.